Beyond routine dusting and damp mopping, it’s necessary to take the help of a professional cleaning company in London to improve and maintain the appearance of your floors. 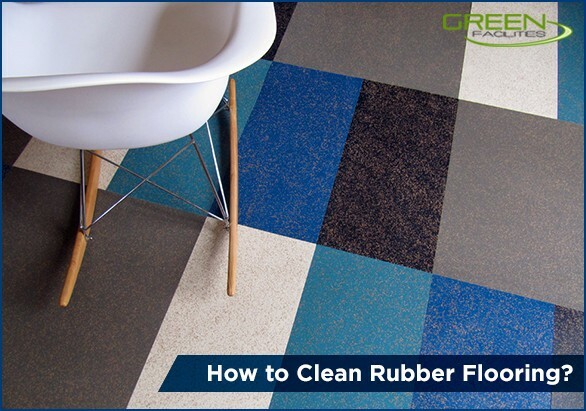 How to Clean Rubber Flooring? There are innumerable advantages associated with the rubber flooring. Safety, durability, and shock absorbing quality are few of those. Many facilities adapt to rubber flooring due to the mentioned qualities. The different types of rubber flooring such as rolled or interlocked tiles can be used to provide the necessary comfort and safety. Another stand-out feature is its ability to stand wear and tear for a very long period of time. Public areas such as shopping centres, gyms, and medical facilities use rubber flooring. • Avoid using excessive water as it may pull away the adhesive. • Routine cleaning will extend its life like any other flooring. 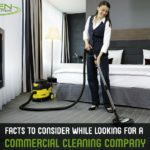 Do not hesitate in contacting a reputed commercial cleaning service in London to guide you through the cleaning process. At Green Facilities, We have years of experience in cleaning all types of floors. The inept chemicals and equipment can cause damage to your floors. Schedule an appointment with us today to experience a top-notch cleaning service. Cleaning laminate, tile, and carpeted floors is easy but when it comes to maintaining and cleaning hardwood floors things become a little tedious. Who doesn’t wish the gorgeous hardwood floors stay shiny forever and ever. 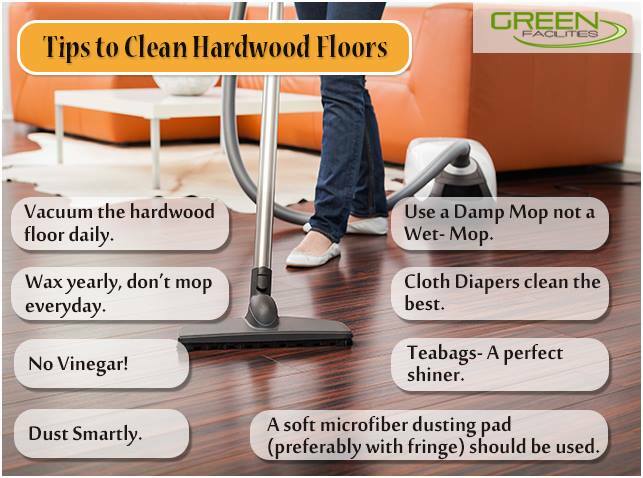 Here is some of the best hardwood floor cleaning tips that you can follow to keep your floor as new as ever. The most crucial first stage of cleaning is to vacuum the floor every day, or just dust mop it when you are pressed with short of time. If your floors are waxed, you should never mop them. Wiping up spills right away is better than mopping everyday. Using vinegar is an old technique. Recent studies show that diluted vinegar or ammonia should never be used to clean hardwood floors. The acid can etch the finish, making it look dull. Vinegar is acidic and slowly eats away at the poly coating, or wax coating. Frequent dusting with either a mop that has been treated with a dusting agent or disposable electrostatic cloths is highly recommended. This should be enough to keep things clean between semi-annual deep cleanings. The correct way to deep clean your hardwood floors is using a slightly damp cloth, barely involves any water at all. The mop should not be wet to touch. Cloth diapers work well for buffing, because they’re very soft and absorbent. Those having babies at home can get shiny wood floors anytime. Using a solution involving two teabags and boiling water adds a beautiful shine on hardwood floors. Using a soft micorfiber dusting pad which runs along all the baseboards without lifting it is highly recommended. Run it up and down the room, like mowing the lawn, again not lifting the mop. 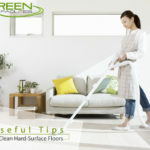 Lifting the mop allows larger debris to get under the mop pad, which can scratch the floors. You want the larger debris to be trapped by the fringe and pushed ahead of you while dust and dirt is trapped by the microfiber pad. End the hardwood floor cleaning spraying the floor lightly with water, or a cleaner specifically formulated for wood floors, followed by dry mop wiping.